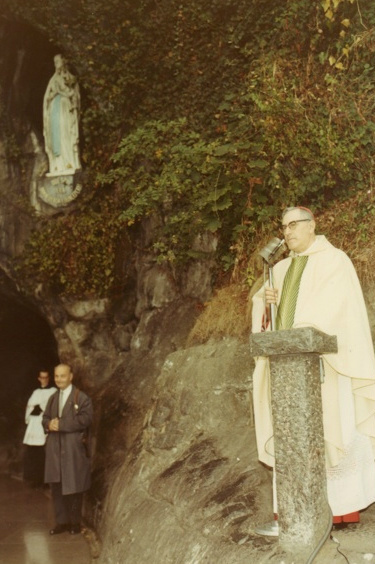 Pope Gregory XVII speaks to pilgrims at the grotto at Lourdes, where our Blessed Mother appeared from February 11-16, 1858. In 1958, one hundred years later, the masonic takeover occurred after Pope Gregory XVII was elected on October 26. What might his posthumous mission be? This week is special: Monday is the Feast Day of Our Lady of Lourdes (Feb. 11), and Friday is the Feast of Our Lady of Banneux (Feb. 15). Let us implore the help of our Blessed Mother Mary, Mediatrix of All Graces, for the Papacy in Exile and for the French Monarch! I did not say that your mortal eyes would see this star arise in the last days… But at the doors of My Heaven, in this high transport, I will make it arise to the eye of your soul, the same as to the eyes of all my children. These will be invited to look at this faithful message which will bring salvation through fighting. From Heaven, you will see the triumph of the Church hover in front of My servant, [Prince] Henry of the Cross: his name is written in the book of gold. He will come to console the indigent, renew the devastated priesthood, weakened and fallen like a branch under the saw of the worker. His charity will renew the priesthood, will again raise up the statues of My Mother, will bring back the insulted Calvaries which have been reduced to shreds. The revelation that Marie-Julie Jahenny has a posthumous mission should not surprise us, as the Saints in Heaven are able to actively help people on Earth, such as when they intercede for us before God in answer to our prayers. Before we reflect on Marie-Julie’s posthumous mission, it is worth our while to reflect for a moment on the posthumous missions of Pope Gregory XVII, and the other true Popes. What might their responsibilities be in helping their Successor and the Church Militant? ...To strengthen His Holiness of the Cross, Pope Gregory XVIII. ...To remove barriers (both present and future) for the French Monarch, Prince Henri. While the actions of hell seem to be powerful on earth, our Faith tells us that this can only be a satanic illusion, for the true power rests with God our Creator. Storms, for instance, have been dramatically reduced or stopped in answer to the prayers of the Church Militant. So have some illnesses, potential tragedies, and injustices. Where there is prayer in communion with Pope Gregory XVIII, prayers are heard by the Almighty God; we have plentiful evidence of this. May His Will be done, for there are so many who need our prayers! It will be a “passing over” of our Lord Jesus Christ’s Justice, like the Angel passing over the homes of the Israelites in the Old Testament [Exodus 12:29]. “Night will not rule”, meaning that evil’s time will be over. In other words, God’s Justice prevails, the Truth of God is no longer suppressed, and there is a resurgence to the true Faith of the One, Holy, Catholic, and Apostolic Church. We will know that we are “are at the door of the great days” and we will await the coming of “the great deluge” which, if we have not already lived them, will be the 3 Days of Darkness. This seems to refer to the inner warning which we will receive “before the roads on earth are closed” [another prophecy given to MJJ] so that we can get to Brittany, the special place prepared for us to survive. And Marie-Julie does come to us, across time, through her prophecies, which are more relevant to our day and more clearly understood, because the unjust and painful Silent Exile of the Papacy, with the resulting destruction of the priesthood and defiling of the holy sacraments have all happened as Heaven has said. So now we await the prophecied saviour, Prince Henri. Marie-Julie has been told that Heaven protects him. In other words, the waiting will have ended. Prince Henry’s actions will “console the indigent”; that is, those who have suffered real hardship and deprivation. This French Monarch will also “renew the devastated priesthood” by first helping the Holy Father out of His Silent Exile and onto the Seat of Saint Peter for all to see. The French Monarch may be called “Henry of the Cross” because of his prophesied alliance with the See of the Cross; that is, the Pope in Exile. Holy Mother, through Thy holy apparitions at Lourdes and Banneux, intercede for Henri of the Cross and for the See of the Cross!